Ralls' Introduction to Materials Science and Engineering is intended for students who want to learn about the nature of solid substances and, especially, for beginning engineering students who are making their first serious contact with the structure and properties of real solids. It represents, clearly and logically, the chemical and physical principles on which the properties of materials depend. The basic relationships introduced in general chemistry and physics courses are reviewed and extended in order to permit the student to relate the properties of ceramic, metallic, and polymeric solids to their internal structure and external environment. 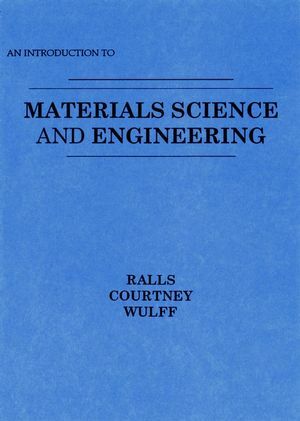 Kenneth M. Ralls and Thomas H. Courtney are the authors of An Introduction to Materials Science and Engineering, published by Wiley. Chemical Equilibrium and Reaction Rates. Index of Specific Materials and Substances.